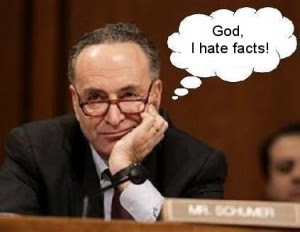 The New York Post is reporting on signs that Senator Chuck Schumer - a key to the Senate vote - will back President Obama's Iranian nuclear sellout. That’s the implication of a little-noticed YouTube video on which he was last month captured talking with a delegation of Orthodox Jews in Washington. The video has been given little coverage, even as Schumer emerges as a pivotal figure in the debate in the Senate. The meeting was with a delegation of one of the most distinguished Jewish groups, the Orthodox Union. It was apparently filmed on a cellphone by a member of the audience and was uploaded onto YouTube in June. Then he proceeded to talk tachlis anyhow, characterizing the question as “which is better — no agreement or an agreement that is not close to the ideal.” It would, though, be inaccurate to suggest that Schumer simply endorsed what the administration is doing. Then, toward the end of his remarks, he asked that the door be closed. “This is the tachlis part,” the senator said. He spoke of how the failure to reach an agreement would leave sanctions in place but only if everyone else stays in. “It so bothers me to have the Jewish fate in European hands,” Schumer said. “We’ve been through this before, we Jewish people,” Schumer said. He then spoke of what a difficult decision he was facing. Noting that he’d been an elected official for 41 years, he said he would not let political pressure interfere. I keep being told that Orthodox are "conservative." Listen to the fawning tone of introduction of "the" Democrat in the video. I'm very confused. Did that Orthodox group host people like Ted Cruz or Allen West? Or Tom Cotton, who, G-d bless him, seems to have uncovered "SIDE DEALS" that Americans are apparently not qualified to know about. BTW, one of the reasons the Hezbollah rockets got through in 2006 was that the IDF (and fighter bomber jets) were convinced to pull back in S. Leb. multiple times, by Condi, meaning that the rockets went on for a month. The point would be to tell the civilians in advance to get out of S. Leb because, if rockets come out of a S. Leb site, then it will be flattened. Was Sen. Schumer over there in 2006? No? Well, I was. And if Israel decides to stop in its tracks the bombing of civilians, NO AMERICAN should try to force them not to.